Hilari Bell’s thrilling finale to the Goblin trilogy! Alliances are once again tested, and the fate of the entire kingdom rests in the hands of some unexpected heroes. A multitude of vicious barbarians is out to take over the Realm. The only ones who know what it will take to stop them are teenage hedgewitch Makenna, former knight Tobin, his well-meaning but often naïve younger brother, Jeriah—and a whole lot of goblins. They’ll need to work together to formulate a plan. The answer lies with the Otherworld Spirits and also with the blood amulets that give infinite power to the barbarians. The question is: Can they band together and save the Realm in time? Readers will relish the intricate politics, high adventure, and intensely satisfying conclusion to this epic trilogy. Master storyteller Hilari Bell’s world-building fantasy-adventure has just the right combination of complexity and accessibility and will appeal to fans of Kristin Cashore’sGraceling. This tour is a bit different. 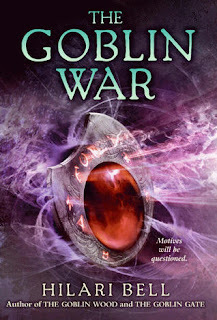 The Goblin War is the third book in Hilari Bell's series. If you have read the first two please say so in the comments. If you have not, but the book has got your attention, Hilari Bell is willing to send the first two books on tour along with the third. Need only FOUR sign-ups to begin tour, but open for SIX. Please leave a comment below with your NAME/STATE and if you have read the first two books, or if you want to read all three books. Please, please let us know if you're signing up only for The Goblin War or for all Three books in your comment. All three books - Two weeks to read all three and one week to post review of The Goblin War. I would like to read all 3 books. I'm in Kansas. I would like to sign up =) I would need to read all three books since I have not read any. This series sounds interesting! Please sign me up for all 3 books! Thanks! I have filled out your form previously, do I need to do it again? Hello! Are you still looking for more participants for The Goblin War? I would need all three books but I would love to participate!